Hello! 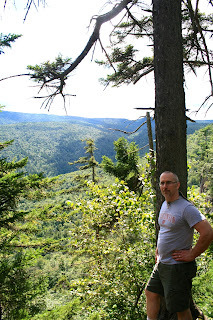 Today I have another post of our New Hampshire Vacation. In my last travel post I talked all about our visit to Arethusa Falls. Well the Arethusa Falls trail is actually a five mile loop that also connects to the Frankenstein Cliff Trail. After our long, vigorous hike to see Arethusa Falls, we decided we didn't want to go back the same way we came up because we wanted to see something different, so we took the Frankenstein Cliff Trail back down. BIG MISTAKE. Now, on the map this trail looks short, and it is described as a 'moderate, well-marked trail', I beg to differ! This was probably the most difficult hiking trail I have ever taken in my life and we were completely unprepared for it. Now, I'm over fifty, but I'm in good shape and walk constantly with my job, my husband is an older athlete and he is in great shape, and I had my two twenty-something 'boys' with me who are also in good shape, and I think we were all frustrated with this trail at some point. The first picture below shows the rugged sign of the trail and the miles. What I didn't know when we started the walking the trail was that Frankenstein Cliff is a 2500 foot sheer face of rock and the path (if you can call it that), gains about 1400 feet of rugged elevation and takes about three hours to walk. I thought it would take about 20 minutes, so we had no water, no walking sticks, compass, or anything else a smart, well-prepared hiker would have. We did see a sign like the one pictured below which added to my worries as we entered the dark, endless, lonely forest. In the picture below you can see my son standing at the top of the trail. I don't have a lot of pictures of the actual hike, because I was too busy trying to climb and not stumble to take photographs, but the trail is very steep, and filled with either a lot of small jagged rocks like in the picture below, or tree limbs, steep climbs, and lots of mud and water. There are also a couple of little brooks you have to cross over by stepping or jumping on stones. (If you click on the Frankenstein Trail link above, you can see more examples of the ruggedness of this trail). It can be a scary experience because there aren't a lot of people on this trail. In fact, in the three or four hours we hiked, I think I saw only four other groups of hikers, which is really small considering we were there during prime tourist season and a lot of other places we visited were filled with people. I think they must have known how hard this hike was and avoided it. 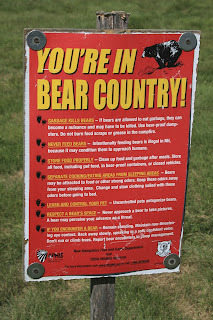 Besides the worries of running into a bear, we also worried about getting lost. Because the trail was so rugged, there were many times that we questioned whether we were going in the right direction. The only markings were an occasional blue paint splatter on a tree or a rock, that sometimes turned to a yellow marking for a different trail. If we didn't see a blue paint splatter for awhile, we would always start to worry, but then we would breathe a sigh of relief when we did see a marking for we knew we were safe. The trail seemed endless to me. Every time I thought we were near the end, we'd go back up again, then we'd start to climb down, then suddenly we were climbing steep rocks and clinging to tree limbs and pulling ourselves back up. and many times we'd reach a point where we would look at a nearly impassable rock formation and see the blue paint splattered on a rock on the other side and we would say 'THEY EXPECT US TO CROSS THAT!'. I think we had all fallen, stumbled, and struggled at some point on the trail. At one difficult, slippery spot in the trail, I needed my husband's help to get down a cliff, and he had to pick me up and set me at the base and I finally just burst out laughing (because I was near tears by then) and said 'What are we doing? Two people, in their fifties, climbing up a mountain with no hiking gear, water, or anything? Are we crazy?'. Have you ever been in such a difficult situation that you felt like crying, but just ended up laughing, because it was so insane? That was the moment for me. HOWEVER, once we started to reach the summit, a glimmer of hope would arise, because we knew we were not only at the half way point, but we would start to see inspiring views through the dense forest like the one my husband is pictured in below. This is the view from the actual summit. It is quite breath-taking, however, all I could think about was that I saw just as pretty views from the comfort of my car the day before, and I didn't have to spend hours climbing rocks and hacking my way through a forest to do so. I think I look pretty good considering everything I had just been through to get here. Notice that the sweater came off and got wrapped around my waist at some point on this hike. I really worked up a sweat. Alright, now it's time to go back down the mountain. I wish I could say it was easier, but it wasn't. The trail doesn't take a direct decent down, but zig zags across the cliff, so many times we were climbing back up again. There was one point in the trail that was so difficult that when my son reached it (who was hiking ahead of us) he screamed back at us : 'They can't be serious! Good luck MOM!" But somehow, I did it. I felt like I should have received a badge that said 'I climbed Frankenstein Cliff' when I was done. By the end of my adventure I had lost a pair of sunglasses, completely destroyed my white sweater which was covered in mud and had several rips and holes in it from snagging onto tree branches, and a bruised and battered body. Now your probably wondering why this trail is called 'Frankenstein Cliff'. My husband theorized that it was because the cliff looked like the face of Frankenstein, but I couldn't see a face of anything in the rock, so I doubted that theory. Then my son said halfway through the trail 'I know why they call this Frankenstein Cliff Trail.....because it's a monster of a trail'. That made the most sense to me, so that is what I assumed was the reason for the name. However, upon getting home and doing some research, we discovered that the trail is named for a German artist who has nothing to do with the monster Frankenstein. I like my son's theory better....Frankenstein Trail IS a monster of a trail. If you decide to hike it, be more well prepared than we were. Wear appropriate clothing, take plenty of food and water, walking sticks, even a rope would be beneficial, and be sure to take a compass in case you get lost. After that tiring hike, we decided to just sit in the comfort of our car, and drive the beautiful scenic routes of the White Mountain Forest, stopping to take a few pictures along the way. Enjoy these lovely scenes of God's Beautiful Creation below. OMGosh what an adventure your trek up and down the cliff turned out to be. I'm sure I would have turned back long before I made it up to the top. Great pictures though and you now have a marvellous tale to tell:O)You have plenty of pluck I must say! Glad it turned out ok for all! 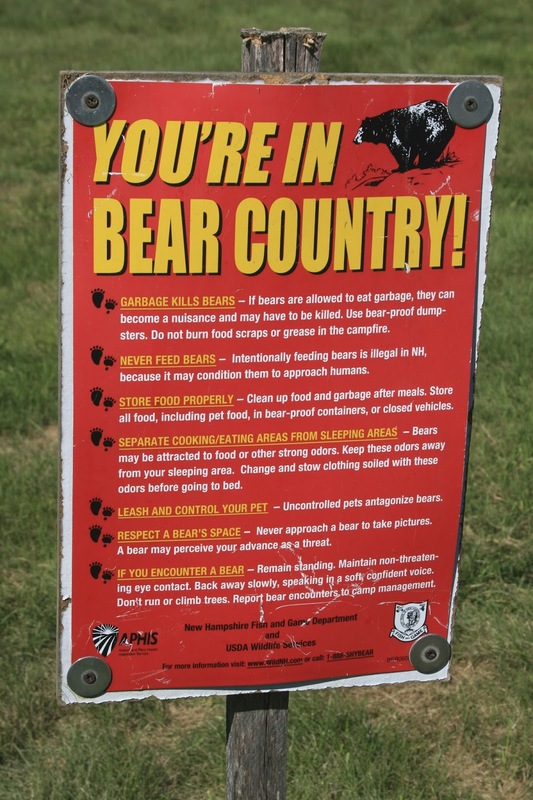 That does look like a very hard trail to walk, and I for sure would have freaked out about the bear sign! Glad you made it all out safely, and I am sure you will all remember this hike smiling about it.